This is an especially large set created from 9 1:24000 scale topographic maps. In addition, some historical notes related to the Chickamauga Dam are included. These maps provide a detailed view of the region prior to the damming of the river in early 1940. The Tennessee Valley Authority brought much needed flood control and hydroelectric power generation to the region. However, significant changes to the shorelines behind the dam enveloped homes and towns. Such is the price of progress. 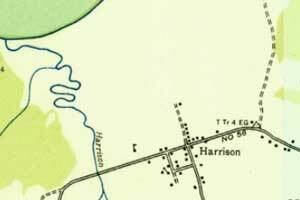 The original location of Harrison, TN sat in lowland that is now Harrison Bay. The 1960 movie Wild River is based loosely on the relocation of this (and many other communities) during Tennessee Valley Authority damming projects of the 1930's. 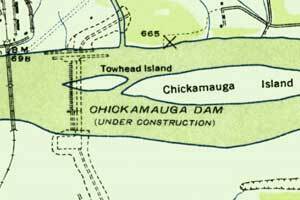 Chickamauga Dam is noted as "Under Construction" on this 1935 map. It was completed ahead of schedule with spillways closed on January 15, 1940. 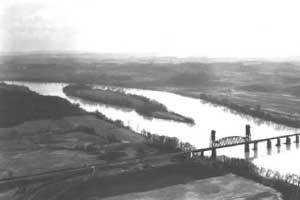 Chickamauga Island (pictured above) disappeared in late March of 1940 when the new lake reservoir overtook it. See newspaper clipping about Dallas Island in the deep zoom collection.